I had a very long and busy week. Especially at work. Felt pretty tensed about almost anything and everything. I get annoyed extra easily and exhaustively tired by the time it reaches around 7pm. And by the time it reaches around 9pm, it's bedtime for me already. Oh boy! This is not the life i'm expecting to have for the next 30 years. My kind of dream life would be to travel around the world before the age of 30. Dine in fancy restaurants. Shop as much as I want. Learn the cultures of others. Take gazillions of photos over the world and etc. It is just a dream and I hope such dream will come true one day. Yesterday wasn't as hectic as few days before. My tasks were completed, job loads and researches were done except for few more files. So I was relaxing a little and tried not to be too stressed about the datelines and quality of work produced at the end of the day. Had a wonderful lunch in Windmill. Then late in the afternoon, I was checking my mail and I was so happy to receive an email from Coffee Bean. Happy not because I got free drinks or cakes or any other merchandises. Happy just because Coffee Bean came out with a new Christmas Limited Edition membership card. I know I'm so easy to be pleased right. I know. I know. Since then, I've been telling my colleague about the card and we talked about how cute the card looks like and stuffs. Typical girls who loves anything and everything which comes in a cute packaging or design. Right after work, the boyfie and I headed to the gym for some workout. God knows when was the last time I visited the gym. For all i knew was during my Uni life where I went to OHM which was located at Bukit Beruang, Melaka. The only thing I did was walking on the treadmill. hahahahahaha! and also some sit ups, and the thing that helps to shape up your flabby arms and thighs. I did all those as well. *deceiving myself* I feel that my arms are slightly slimmer la. HAHAHAHA! After gym, I kept telling the boy about the card and he knows that I really want it. So we headed to the nearest Coffee Bean in order to purchase the card. The Coffee Bean's membership card is different compared to Starbucks membership card. For Starbucks, after purchasing a number of beverages or a whole cake or a tumbler, you will be entitled to get a free frap. Unlike Coffee Bean, every RM1 spent will give you 5 BEANS. BEAN is actually a point. 5 BEANS are equivalent to 5 cents. A cup of Frap will at least cost you about RM14 and above. So each transaction will give you roughly about RM0.70 a.k.a 70 BEANS. 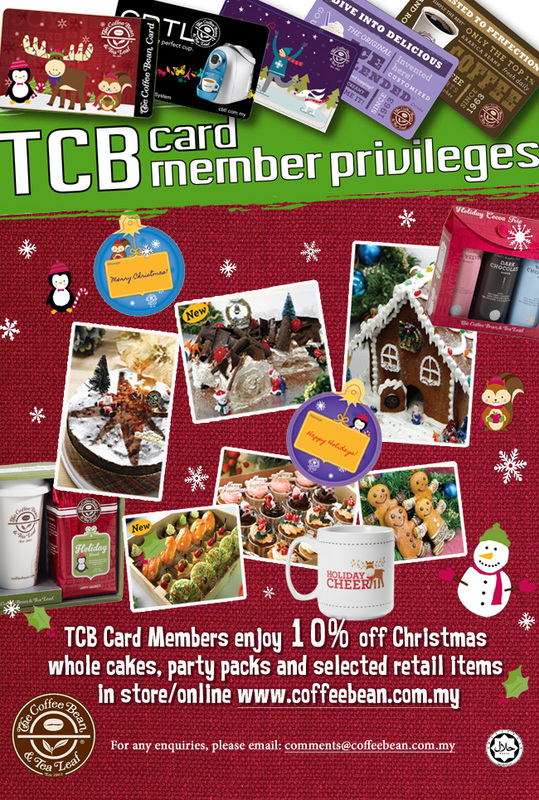 Besides that, you can enjoy a 15% discount on selected retail items in Coffee Bean. The Coffee Bean card comes with a special introductory price of only RM25. Go get your Limited Edition card now! I think it's nicer than the Starbucks card.